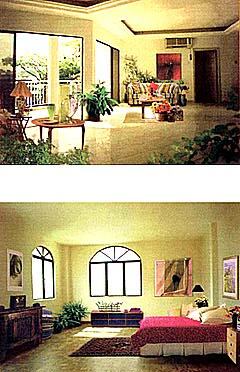 The spacious living and dining area is very well ventilated by breezes that blow through. The balcony on the left provides a view of the swimming pool below. Depending on the unit itself, you may be able to see downtown KL. The bedrooms have high ceilings, parquet floors and ample space for a wardrobe. The suspended ceilings allow the installation of downlights, and the living room has recessed ceilings. Every unit comes with a fully-equipped kitchen with ample storage space. 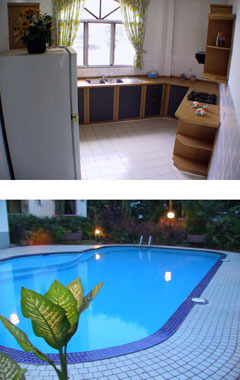 The condominium has a 24-hour security guard, car park space for every unit, elevator, and a pool. The pool is surrounded by a garden, palm trees, barbecue pit and playground for children.